"We need to be told" – Article by Australian journalist and Suharto critic John Pilger（英语：John Pilger） on the fortieth anniversary of the Transition to the New Order, New Statesman, 17 October 2005. Two former strongmen, Soeharto-Lee Kuan Yew meet again. ANTARA. 2006-02-22 [2006-02-22]. （原始内容存档于2007-03-25）. Army in Jakarta Imposes a Ban on Communists. The New York Times. 1965-10-19. Benedict R. Anderson en Ruth T.McVey, A Preliminary Analysis of the 1 October 1965 Coup in Indonesia (Cornell University, 1971). Aspinall, Ed. What happened before the riots?. Inside Indonesia. October–December 1996. （原始内容存档于2005-05-05）. Attorney general doubts Soeharto can be prosecuted. The Jakarta Post. 2005-05-27. Blum, William. Killing Hope: US Military and CIA Interventions Since World War II. Monroe, Me. : Common Courage Press. 1995. ISBN 1-56751-052-3. CIA Stalling State Department Histories. The National Security Archive. [2005-05-23]. Colmey, John. The Family Firm. TIME Asia. 1999-05-24. Robert Edward Elson. Suharto: A Political Biography. Cambridge, United Kingdom: Cambridge University Press. 2001-11-13. ISBN 978-0-521-77326-3. H.AMDT.647 (A003): An amendment to prohibit any funds appropriated in the bill to be used for military education and training assistance to Indonesia. THOMAS (Library of Congress). [2006-02-04]. （原始内容存档于2016-01-13）. Indonesia: Arrests, torture and intimidation: The Government's response to its critics. Amnesty International. 1996-11-27. （原始内容存档于2006-03-13）. Indonesia Economic. Commanding Heights. [2005-05-23]. Jakarta Cabinet Faces Challenge. The New York Times. 1965-12-16. Koerner, Brendan. How Did Suharto Steal $35 Billion? Cronyism 101. Slate. 2004-03-26 [2006-02-04]. Lashmar, Paul and Oliver, James. MI6 Spread Lies to Put Killer in Power. The Independent (UK). 2000-04-16. Lashmar, Paul; Oliver, James. Britain's Secret Propaganda War. Sutton Pub Ltd. 1999. ISBN 0-7509-1668-0. Public Expenditures, Prices and the Poor. World Bank. 1993. （原始内容存档于2007-03-23）. Simpson, Brad. Indonesia's 1969 Takeover of West Papua Not by "Free Choice". National Security Archive. 2004-07-09. Schwarz, A. A Nation in Waiting: Indonesia in the 1990s. Westview Press. 1994. ISBN 1-86373-635-2. Suharto tops corruption rankings. BBC News. 2004-03-25 [2006-02-04]. Tapol Troubles: When Will They End?. Inside Indonesia. April–June 1999. （原始内容存档于2012-03-05）. Toer, Pramoedya Ananta. The Mute's Soliloquy: A Memoir. Penguin. 2000. ISBN 0-14-028904-6. United Nations High Commission on Human Rights resolution 1993/97: Situation in East Timor. United Nations. [2006-02-04]. Legacy of Ashes: The History of the CIA（英语：Legacy of Ashes: The History of the CIA）, Tim Weiner. Doubleday, New York 2007 (ISBN 978-3-596-17865-0), chapter 15, CIA and Indonesia. Whose Plot?-New light on the 1965 Events, Journal of Contemporary Asia 9, no.2 (1979):197–215. ^ Berger, Marilyn. Suharto Dies at 86; Indonesian Dictator Brought Order and Bloodshed. The New York Times. 2008-01-28 [2008-01-30]. 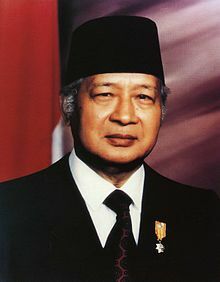 ^ Soeharto, as related to G. Dwipayana and Ramadhan K.H. (1989), Soeharto: Pikiran, ucapan dan tindakan saya: otobiographi (Soeharto: My thoughts, words and deeds: an autobiography), PT Citra Lamtoro Gung Persada, Jakarta. ISBN 978-979-8085-01-7. ^ 細節詳見第2章。'Akar saya dari desa' (My village roots), in Soeharto, op. cit. ^ 7.0 7.1 7.2 7.3 7.4 7.5 7.6 7.7 McDonald, Hamish. No End to Ambition. Sydney Morning Herald. 2008-01-28. ^ Commission for Reception, Truth and Reconciliation in East Timor（英语：Commission for Reception, Truth and Reconciliation in East Timor） Benetech Human Rights Data Analysis Group. The Profile of Human Rights Violations in Timor-Leste, 1974–1999. A Report to the Commission on Reception, Truth and Reconciliation of Timor-Leste. Human Rights Data Analysis Group (HRDAG). 2006-02-09. （原始内容存档于2012-02-22）. ^ Suharto tops corruption rankings. BBC News. 2004-03-25 [2006-02-04]. ^ 12.0 12.1 McDonald (1980), p. 10. ^ 13.0 13.1 McDonald (1980), p. 11. ^ 14.0 14.1 Elson, Robert E. Suharto: A Political Biography. Cambridge, United Kingdom: Cambridge University Press. 2001: 1–6. ISBN 0-521-77326-1. ^ Romano, Angela Rose. Politics and the press in Indonesia. 2003: ix. ISBN 0-7007-1745-5. ^ Elson, Robert E. Suharto: A Political Biography. Cambridge, United Kingdom: Cambridge University Press. 2001: 8. ISBN 0-521-77326-1. ^ Elson, R.E. Suharto: A Political Biography. Cambridge, United Kingdom: Cambridge University Press. 2001: 9. ISBN 0-521-77326-1. ^ 21.0 21.1 McDonald (1980), p. 14. ^ Elson, R.E. Suharto: A Political Biography. Cambridge, United Kingdom: Cambridge University Press. 2001: 14–15. ISBN 0-521-77326-1. ^ Elson, R.E. Suharto: A Political Biography. Cambridge, United Kingdom: Cambridge University Press. 2001: 15–17. ISBN 0-521-77326-1. ^ Elson, R.E. Suharto: A Political Biography. Cambridge, United Kingdom: Cambridge University Press. 2001: 18–20. ISBN 0-521-77326-1. ^ Elson, R.E. Suharto: A Political Biography. Cambridge, United Kingdom: Cambridge University Press. 2001: 22–23. ISBN 0-521-77326-1. ^ Elson, R.E. Suharto: A Political Biography. Cambridge, United Kingdom: Cambridge University Press. 2001: 25–27. ISBN 0-521-77326-1. ^ Elson, R.E. Suharto: A Political Biography. Cambridge, United Kingdom: Cambridge University Press. 2001: 29–38, 42–44. ISBN 0-521-77326-1. ^ McDonald, Hamish. Suharto's Indonesia. Fontana Books. 1980: 24–25. ISBN 0-00-635721-0. ^ 31.0 31.1 Elson, R.E. Suharto: A Political Biography. Cambridge, United Kingdom: Cambridge University Press. 2001: 49–52. ISBN 0-521-77326-1. ^ McDonald, Hamish. Suharto's Indonesia. Fontana Books. 1980: 25. ISBN 0-00-635721-0. ^ 33.0 33.1 Elson, R.E. Suharto: A Political Biography. Cambridge, United Kingdom: Cambridge University Press. 2001: 52–55. ISBN 0-521-77326-1. ^ Elson, R.E. Suharto: A Political Biography. Cambridge, United Kingdom: Cambridge University Press. 2001: 70–73. ISBN 0-521-77326-1. ^ McDonald, Hamish. Suharto's Indonesia. Fontana Books. 1980: 31–32. ISBN 0-00-635721-0. ^ Elson, R.E. Suharto: A Political Biography. Cambridge, United Kingdom: Cambridge University Press. 2001: 80–87. ISBN 0-521-77326-1. ^ Elson, R.E. Suharto: A Political Biography. Cambridge, United Kingdom: Cambridge University Press. 2001: 87–89. ISBN 0-521-77326-1. ^ 謝詩堅. 馬來西亞在磨難中誕生. 東方日報. 2012年9月12日. ^ 39.0 39.1 Elson, R.E. Suharto: A Political Biography. Cambridge, United Kingdom: Cambridge University Press. 2001: 90–93. ISBN 0-521-77326-1. ^ 41.0 41.1 41.2 上台排華搶光燒光. 蘋果日報. 2008-01-28.